Peanut butter and jelly sammiches may be one of the greatest foods on earth. Even as an adult I still crave a pb+j quite often. (I won’t lie, I have 5 different kinds of jelly in my fridge right now.) 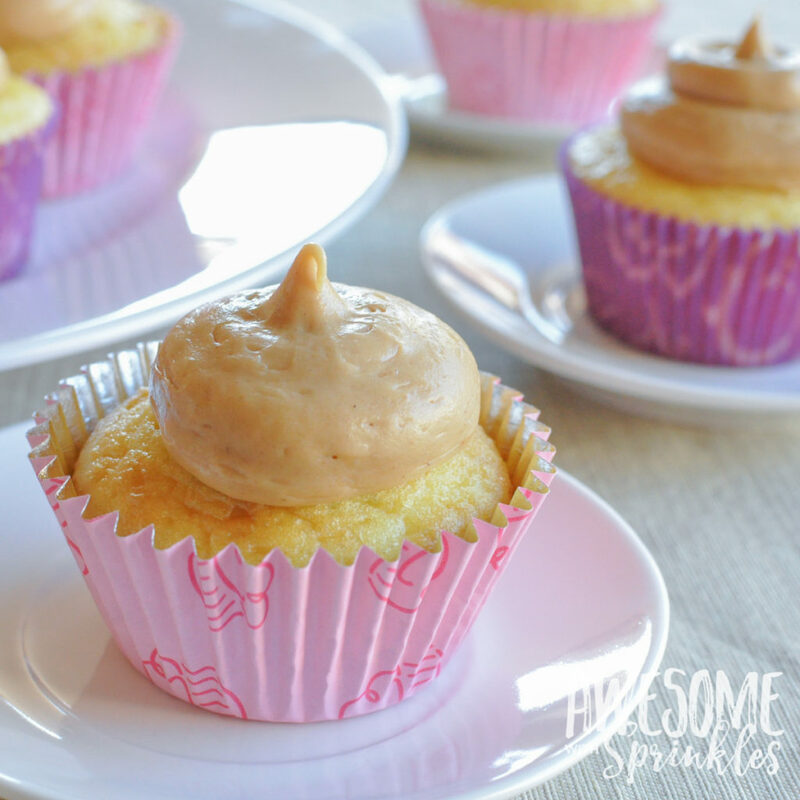 These cupcakes are super easy to make and they pair perfectly with a milk mustache! 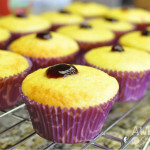 You can fill the cupcakes with your favorite jam, jelly or preserves (Don’t know the difference? Don’t worry, neither did I). I was going with classic PB+J for this party so I did two different flavors – grape jelly and strawberry preserves. Thus the pink and purple wrappers to distinguish each type. 🙂 You could use a fancier jam to jazz things up a bit. 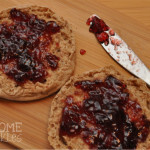 Apricot preservers, marmalade, blackberry or my personal favorite – huckleberry – would all work well! Or try something more savory like jalapeno jelly! Yum! If you have never filled cupcakes before it is really quite easy. Here are two of my go to Super Easy Techniques for Filling Cupcakes. 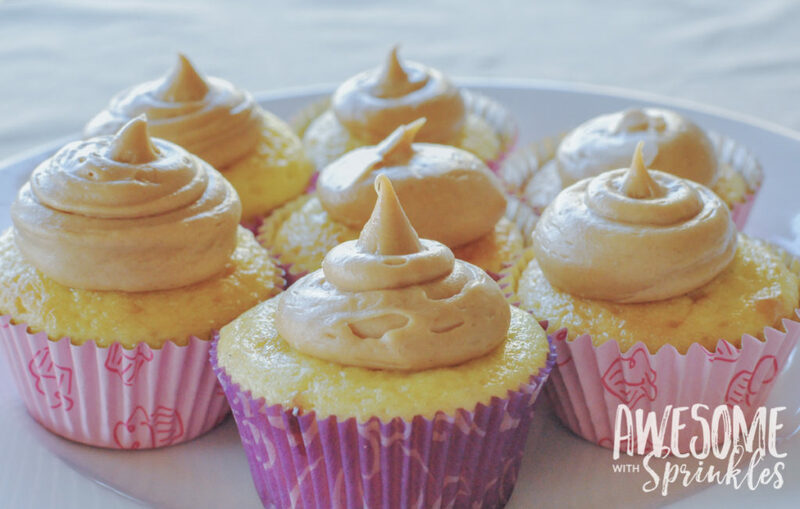 If you want a clean look to your cupcakes (or want the filling to be a surprise) be sure to wipe or spoon off any excess jelly that might have oozed out of the cupcakes so that you don’t end up with a slippery, sticky mess when you try to put frosting on top. Alternatively, you can spread a little more jelly on top so that it peeks out underneath the frosting. 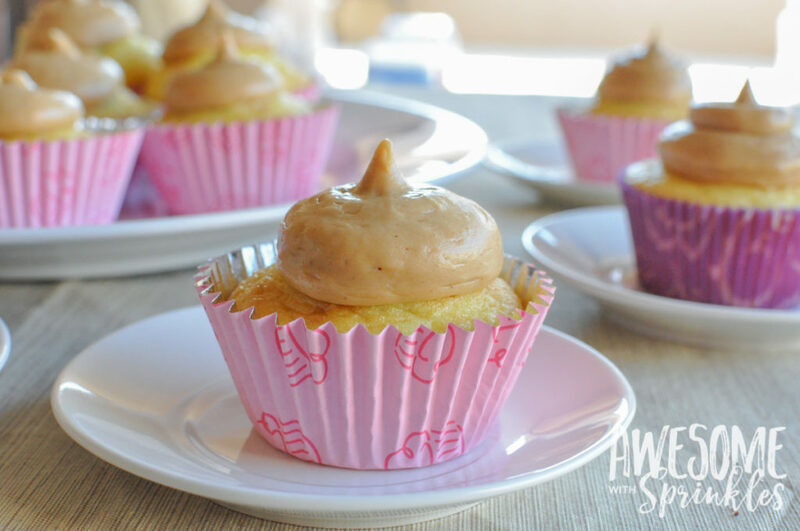 If you like peanut butter, this may be the best frosting in the world. Seriously. Sooooo darn good! You can spread the frosting by hand for a classic and messy look or you can pipe the frosting so that it is nice and neat. 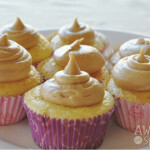 I like to use a low sugar natural brand of peanut butter (like Skippy Natural Creamy Peanut Butter) for the frosting. It gives a rich peanutty flavor and isn’t too sweet to start since you will be adding plenty of sugary goodness to it. 😉 I have also found that no-stir peanut butter tends to work better than the natural kind that you have to stir. These cupcakes are a huge hit with adults and kids alike and the best part is that you don’t have to cut off the crusts! Preheat the oven to 400º degrees F and fill 24 cupcake/muffin cups with liners. In a large bowl, add the cake mix, buttermilk, eggs and oil and mix together until fully incorporated. Pour batter into liners filling until about 2/3 full. Bake in the oven at 400º degrees F for the first 5 mins. Then lower the temperature to 350º degrees F (do not open the oven door) and bake for the remaining time suggested on the cake mix box (which is usually about 19-23 mins TOTAL) or until a toothpick inserted into the middle comes out clean. Remove cupcakes from the oven. Allow to cool for just a few mins before transferring to a wire rack to cool completely before filling and frosting. 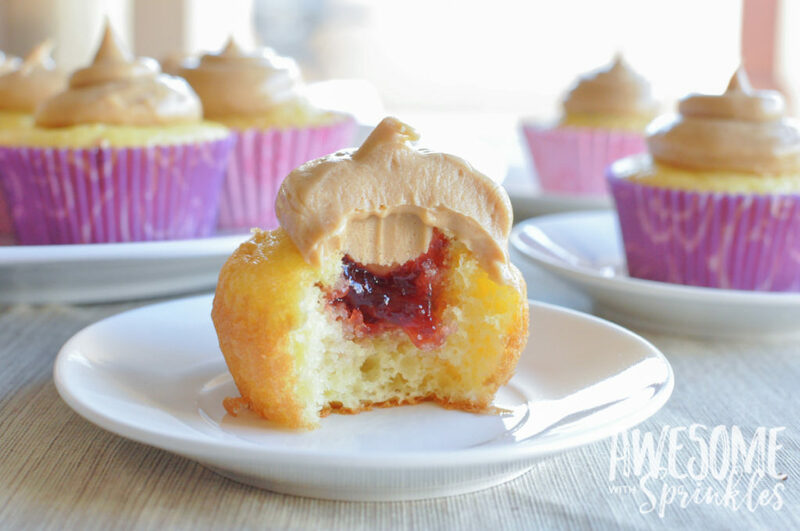 Once cupcakes are completely cool, fill them with about 1-2 tsp of your favorite jam or jelly. 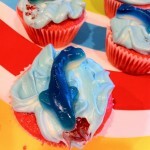 See the related link for easy cupcake filling methods. To make the frosting, start in a large bowl of a stand mixer fitted with the paddle attachment (or with a hand mixer). Beat the peanut butter and butter until smooth and creamy. Add the vanilla and salt and mix until incorporated. Add the confectioners sugar, a little at a time, to the peanut butter mixture and mix on medium low until smooth after each addition until all of it is incorporated. Be sure to scrape down the bowl with a rubber spatula as you go to make sure all of the confectioners sugar gets mixed in. Add the heavy cream and beat on high until light and smooth. Pipe large dollops of frosting onto each cupcake. Garnish with mini peanut butter cups, chocolate sprinkles, nutter butter cookies or whatever you fancy! Throw a PB + J Party! These cupcakes would be perfect for a sleep over, a summertime picnic, a back-to-school get together and more! One of my gal pals threw a “Forever Young” themed birthday party where she invited everyone to come be kids again for the evening. 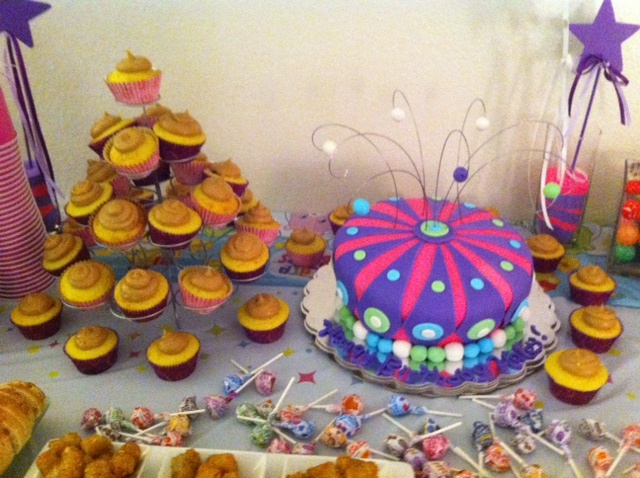 Since she grew up in the 80’s we also incorporated some fun stuff from childhood into the party like playing the theme songs from shows 80’s all night and serving grilled cheese, Snack-Paks, spiked Kool-aid Squeeze-its a topsy-turvy cake and other 80’s kid staples. 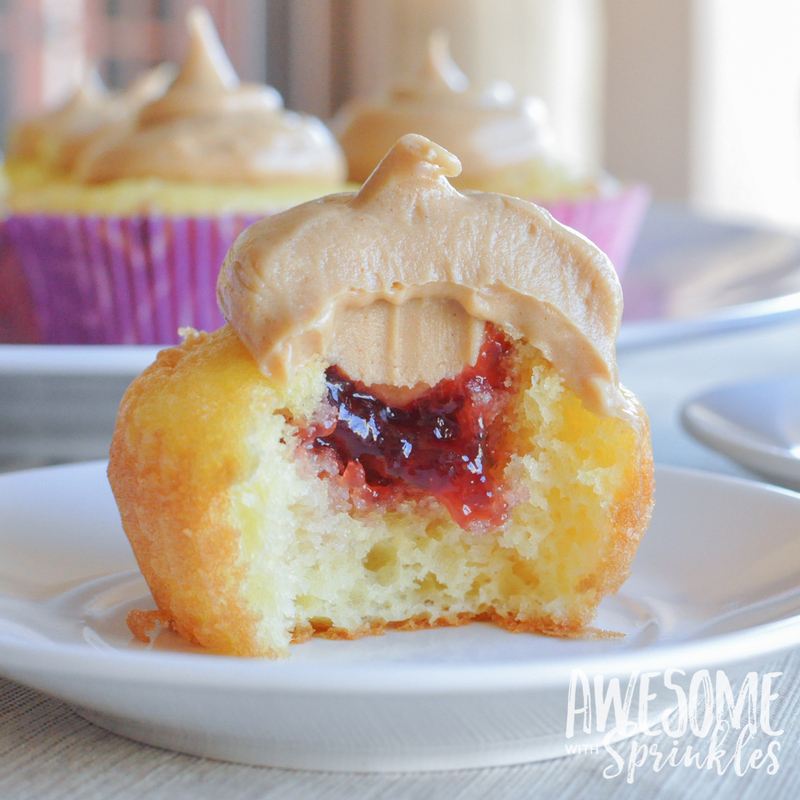 And what could be better than a twist on every kids’ favorite food – PB+J – for dessert! 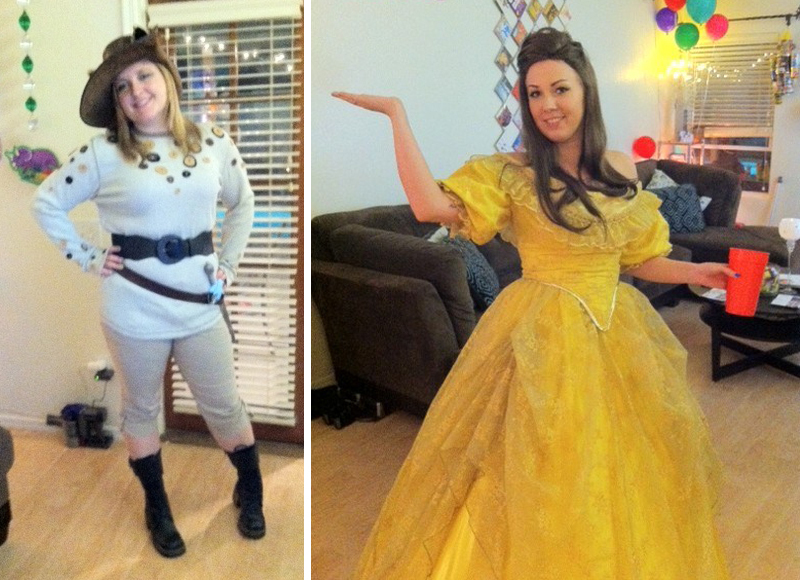 That’s me on the left as Puss in Boots and Haley as Belle. *Note: that is NOT her real hair. She had super short white hair and the time and was rocking that giant wig! Go girl!